Simply put, this is one of my favorite series of all time. One of the few that completely lived up to the hype for me - the writing is great, the characters are great, the world is great, the drama is great. I don't feel the need to write a 5000 word essay on why I love this series. 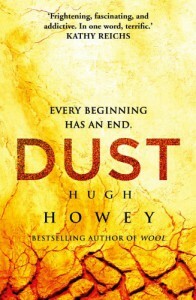 Dust is a fitting ending, ties up a lot of the loose ends that remained, introduced some new characters and finished up what was started a couple years ago. I couldn't recommend this series any harder. Please read it.